Join us for a little after hours fun and a chance to take home some cash. We will be hosting a 3D Scrambles (Jackpot Shoots) Saturday, Feb. 24th with team draw and shooting starting promptly at 5pm (please arrive early to warm up). You are strongly encouraged to reserve your spot in advance. There is no cost for this. $15 per person cost. $10 goes to the pot. Please bring cash. Luck of the draw 2 person teams. 20 targets spread 2 animals per lane (10 lanes). 1 arrow per person per animal with the best arrow scoring for the team for each animal. The targets are scored by the team next to you. The top 3 scores pay out. You can win up to $750 in cash and over $750 in prizes including a custom built drum smoker grill, hunter safety systems, Beronett ground blind and more (based on 30 shooters in the league). 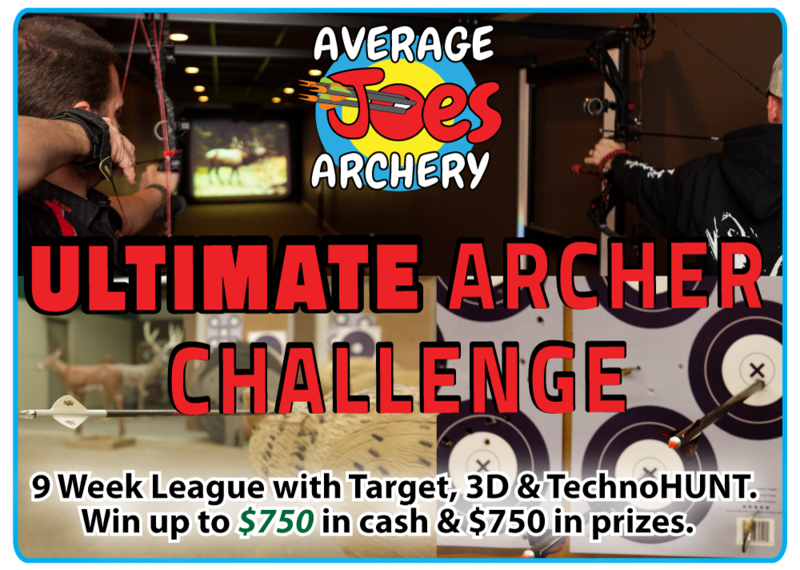 Starting Oct. 12th we will be having our Archer Challenge league. This 10-week league will feature 3 weeks of 5 Spot target shooting (360 rounds), 3 weeks of 3D foam targets and 3 weeks of TechnoHUNT video archery simulator shots. We will have one makeup week where you have the option of shooting either a 5 spot OR 3D round. Since there will be prize money on the line we will have a FIRM line time of 6:00 each Thursday night for the 5 spot and 3D weeks so all scoring can be verified by other shooters. The cost will be $125 per shooter with $25 going to the prize pot. $5 to the pot for each of the 3D, 5 Spot, and TechnoHUNT rounds and $10 to the pot for the overall top 3 shooters. League is limited to 30 shooters. League starts October 12th. The 12th, 19th, and 26th are 5 spots weeks. November 2nd, 9th, and 16th will be 3D targets. The league will be off for Thanksgiving. Nov 30th, Dec 7th, and 14th will be TechnoHUNT weeks with the 14th being also a makeup week for 5 Spot and 3D. The league banquet on the 21st at 6 PM. We will also be hosting a couple of 3D Scrambles on 9/15 and 9/22 with team draw and shooting starting promptly at 7pm (please arrive early to warm up). We Turn 8 So You Get 8% OFF! Today is Average Joes Archery’s 8 year anniversary! To celebrate we are offering 8% off of any new bow purchase and for new bow purchases over $500 you will receive 1/2 dozen of your choice of Beman ICS Bowhunters, Easton Aftermath, or Victory Sport arrows. Sale applies for both in-stock and special order bow purchases. Sale ends 6/9. Thanks for 8 years of supporting Average Joes Archery. Posted in General News & Events | Comments Off on We Turn 8 So You Get 8% OFF! Join us for a little after hours fun and a chance to take home some cash. We will be hosting 3D Scrambles (Jackpot Shoots) Thursday nights 6/1 – 6/22 with team draw and shooting starting promptly at 8pm (please arrive early to warm up). Join us for a little after hours fun, Chanticlear Pizza and pop, and a chance to take home some cash. We will be hosting a 3D Scramble (Jackpot Shoot) Friday, March 17th at 7pm. Please reserve your spot so we can make sure we order enough pizza. $25 per person cost. $10 goes to the pot. Pizza and pop available to every paid shooter. The top 5 teams move on to the finals. Finals consist of 5 targets with both team arrows scoring. If you plan on shooting the MSAA State Indoor Regionals (MSAA flier with more info) at Average Joes Archery please use the link below to reserve your line spot. We only have room for 20 shooters per day. Start time is 2 pm on January 21-22, 28-29 and February 4-5, 2017. Please arrive in time to sign up, setup and be ready to shoot at 2pm sharp. There is no charge to reserve your spot (stand MSAA fees will apply to the shoot). Average Joes Archery will be hosting our 1st annual Christmas Fundraiser tournament on Saturday, December 17th to support Anoka County based Toys for Joy. Join us for the shoot and enjoy pizza and door prizes. Call the shop at 763-208-5717 to reserve your spot (limited to 40 shooters). Registration starts at 3 pm and the shoot starts promptly at 4pm. 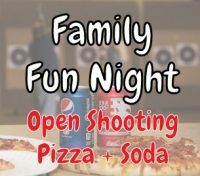 Come join us on Black Friday from 6pm – 9pm for open shooting, pizza and soda. We will have our range set up with 3D foam targets, balloons for the kids and will have our TechnoHUNT running for open shooting (included in the entry fee). We are looking for this to be a great way to get your whole family out to the range to enjoy a sport together (all shooters must be at least 7 years old, if under 18 youth waiver is required). Rental equipment is included in the entry fee, so don’t worry if you or a family member (or an out of town family member) doesn’t have a bow to shoot. We do have limited spots for this event to ensure there is room on the range for everyone to shoot so you are encouraged to purchase your spot in advance. Entry fee is $15 per person. Space is limited and this event has sold out every time, so please reserve your spot ASAP with the link below. Average Joes Archery will be hosting our 1st annual Breast Cancer Fundraiser tournament on Saturday, October 22nd. Join us for the shoot and enjoy pizza and door prizes. Call the shop at 763-208-5717 to reserve your spot.